SaveSense is a free computer application which is presented as a personal online shopping assistant that helps you to find the best online deals at the lowest prices. The application displays coupons, discounts, and banner ads; however, they any not endorsed by the developers, which means that unreliable websites can also be promoted by SaveSense. The browser add-on is available at savesense.com, but it is also possible that to find this application bundled with some other browser add-on or extension. SaveSence works on Internet Explorer, Google Chrome, and Mozilla Firefox, and if you want to remove it from the PC, do not think that you can do it by simply disabling it. It has to be removed from the system along with its additional files, such as cookies and other tracking devices if any are sent to the browsers. SaveSense works on numerous shopping websites, including Amazon, Walmart, and Best Buy. The advertisements can take you to different shopping websites, which are not affiliated with SaveSense. It does not guarantee that the prices that are provided are the lowest possible prices, and it is not responsible for the quality of the products that are being promoted. You interact with the ads and third-party websites at your own risk, and if you do not want to risk accessing insecure websites, remove Save Sense from the PC. Since SaveSense neither controls nor monitors the content of the websites that are promoted, you should extra cautious when browsing the websites that are promoted by the service. If you do know or do not trust the service provider, do not make payments so as not to lose money and personal information. As to computer applications, you should beware of counterfeit software programs. If you are offered a computer program which you have not heard of, do not download it in order not to corrupt the system or cause some system-related issues. Another reason why you should remove SaveSence from the PC is the fact that it can send cookies to your browsers in order to acquire information on your browsing behavior. The third-party websites that you access through SaveSense coupons and ads may also be interested in your browsing patterns and may monitor your search terms, browsing history, and clicks. In order to remove SaveSense from the computer, implement SpyHunter. It will remove SaveSence and the files that are associated with it. You will be protected against other adware programs, Trojan horses, browser hijackers, and many other computer threats. Having finished the uninstall procedure, do not forget to scan the PC. Install the scanner available below at no charge and scan the system to find out what components of the unwanted application have to be removed from the PC. 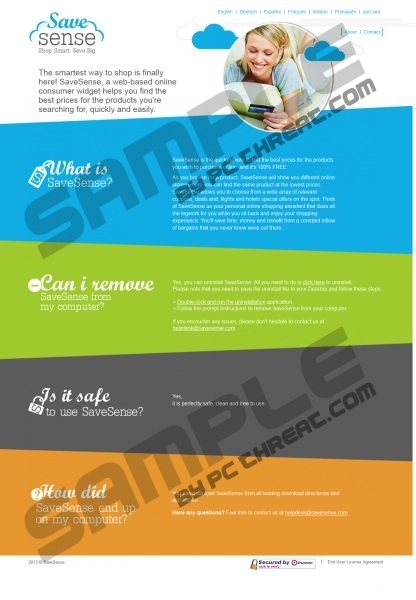 Quick & tested solution for SaveSense removal.